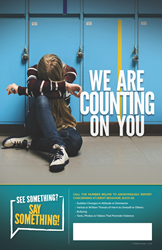 In light of the tragic school shootings impacting communities across the nation, the Calibration Group, LLC, had to act by providing schools with free hotline posters designed to help students confidentially report information that may help prevent future acts of violence. We understand active shooter situations are extremely complex problems, but one thing we can do is provide schools FREE eye-catching posters that remind kids to report their concerns,” said Amber Bradley, owner of the Calibration Group. “We understand active shooter situations are extremely complex problems, but one thing we can do is provide schools FREE eye-catching posters that remind kids to report their concerns,” said Amber Bradley, owner of the Calibration Group. “Peer pressure can be extremely difficult to deal with for many students. The fear of being labeled a ‘snitch’ or even the fear of being wrong can cause students to remain silent when they have concerns about the behavior of other students. The recent school shooting in Florida has inspired many citizens to find ways to help solve this horrific trend. We at Calibration want to do our part, and hope that our contribution will help prevent other horrific events from occurring in our schools,” she said. The Calibration Group’s expertise is in creating print, video and other digital communication that inspires audiences to act and perform in ways that align with the stated values, goals and objectives of organizations. Creative hotline posters are just one of many tools that inspire people to report wrongdoing or suspicious behavior. Calibration Group, LLC, is a full-service marketing, communications, and consulting firm specializing in providing relevant, educational content for loss prevention, asset protection, safety, and security professionals. Calibration has mastered the ability to move beyond simple awareness and communication. We create. We deliver. We inspire.